We’re finally here! Week One. Dun…dun…DUN. This week’s Baby Step is Unrefined Salt. Replace your processed salt with unrefined salt. By now, most of us are aware that processed foods are not healthy. Salt is no exception. The unprocessed – or unrefined – salt that retains its original mineral profile is considered a whole food. Processed foods are bad for us partly because their original nutrient balance is skewed. That contributes to imbalances within our bodies. This will be an easy change to make at home. Buy unrefined salts and use it in place of your old iodized table salt, kosher salt, or pearly white sea salt. 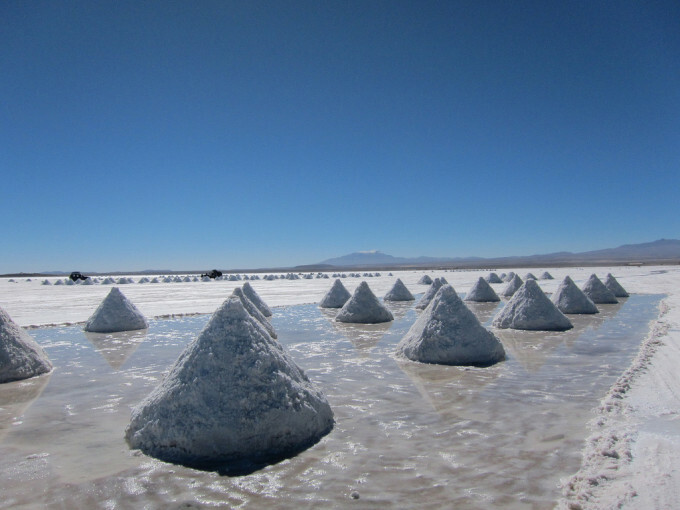 The salt pictured above is dull gray due to the mineral content. As a rule, no color means no minerals. Voila! Baby Step # 1 complete…almost. The difficult part will be avoiding processed salt in convenience foods. There is no need to cut out all your favorite processed foods this week, but we will begin to pare them back with each Baby Step. You can either substitute with better choices or completely avoid the processed foods high in sodium. At home, feel free to salt your food to taste unless you have a condition that requires you to restrict sodium like hypertension (high blood pressure). If hypertension is an issue, we’ll discuss what steps you can take to rebalance certain essential nutrients and begin to moderate or eliminate it. Yay, right? Did you just panic about not being able to eat salty snacks or feel like you’re already going to fail step 1? Don’t worry! Take it slow. You will actually reduce or eliminate your monster salt cravings by providing the balance of nutrients that it is starving for. You are here for a reason. Gather your strength and make the commitment to yourself to MAKE A CHANGE! You want facts? I got yer facts. Sodium is essential to life, so why are all the ‘experts’ trying to get you to stop eating it? Let’s explore the topic a bit. Different batches and brands of unrefined salt will have different mineral compositions, but they all have a varied mineral profile unlike refined salt. Try different brands and use what tastes the best. Trust your taste buds to tell you which one your body prefers. Sea salt in general is considered very alkaline (non-acidic), and the most alkalizing substance we can ingest according to some. This is important, because many people have an acidic pH level due to poor diet and poor elimination pathways. An acidic body is detrimental to health and a main contributor to many diseases. We’ll work our way out of that condition one Baby Step at a time! There are two studies that seem to be the main source for the advice we receive for and against salt intake. The DASH study is well-controlled and very well done. I’m glad we have access to read the report, because it changed my recommendations on sodium intake and made clear how to balance a particular set of nutrients. This study measured two groups, one who ate more of a typical SAD (Standard American Diet) and the other who followed the DASH diet. The DASH diet was the ‘healthy’ one and included a good selection for fresh produce. These participants were given 3 stages of sodium intake – high, moderate, then low – with the results of their vitals measured through each stage. As you would think, the SAD/high sodium group had the most disturbing health symptoms and the DASH/low sodium group the most favorable. The researchers observed that either the lowered sodium increased the effectiveness of potassium [in the diet] or the increased potassium and calcium lowered the sodium content. Since they weren’t sure, they thought both a decrease in sodium and an increase in potassium, magnesium, and calcium were the answer. I say bravo to the basic idea they were trying to get at. Balanced nutrients. Processed foods – including refined salt – throw off that balance. The recommendations for low-fat dairy and a reduction in saturated fat make me sigh, but these recommendations have been based on commercially-raised, grain-fed cows. I’ll cut them some slack on that one. The JAMA study instead focused on a test that measured the sodium levels in the participant’s urine to see if it contributed to overall cardiovascular health. The participants filled out health questionnaires and completed 24 urine tests for analysis. Comparing it to the previous study, it is not well-controlled. There are too many unknown factors that could cause their overall health results. I do think the study has merit. To know that statin drugs are extremely harmful to health and bone broth has amazing healing powers does not require a controlled, double-blind study in my mind. I can use my personal experience to do so. On the other hand, reading about studies of unknown people doesn’t give me the same luxury. I can’t observe or ask any questions about the people who participated as test subjects. If someone was on a vegan low-salt diet, that has a completely different spin that someone who eats as an omnivore (meat & plants). They have access to different nutrient profiles. The JAMA study concludes that very low body sodium levels are detrimental to cardiovascular health. This is where a lot of the uproar came from in the alternative health community about the government salt recommendations being dangerously low. Even with flaws and without additional participant details, I can buy that. Our bodies reflect the ocean and are made up of mainly saltwater. We just need to get them in balance. A brief note on iodine. Iodine is another nutrient that is essential to health and is preferably sourced from whole foods. Some great options are seaweed and seafood, not industrially-processed iodine added to industrially-processed salt. Again, it’s a question of balance and processing. Read more about iodine here. The vast majority of people eat an industrially-processed salt that has been stripped of all but one mineral and no longer resembles food. Refined salt is composed of pure sodium chloride (NaCl) and chemical additives from the refining process or as an anti-caking agent so it ‘flows like rain’. Just another example of how we are the ones who need to protect our health and that of our children. To minimize eating parts for explosives, do some research on the foods you eat. If you don’t cook your meals from scratch, check the nutrition labels of packaged foods you buy for the sodium content. Only choose those low in sodium and preferably ones that contain sea salt. I have yet to find any with unrefined mineral-rich salt. We have all heard of the dangers of eating too much salt. It’s been drilled into us for many years and can be revisited at any yearly visit with your local MD; I won’t rehash it. I never quite knew the mechanism of why too much sodium is bad until recently. Since I found it uber interesting, I’m sharing the love. Sodium attracts water. If there is a high concentration of sodium in the bloodstream, it draws water out of cells and leaves them dehydrated. Now you know why you get so thirsty after a salty snack. Extra water in the bloodstream = water retention. All of those water molecules stick to the sodium molecule and end up puffing you up like the Michelin Man. The extra water plus sodium increases blood volume, meaning you now have more blood in your circulatory system. That extra blood creates pressure on the veins and arteries and is what we call high blood pressure. Cool stuff for us food geeks. I love how you offering these baby steps in “bite-sized” pieces. I think you will help so many people realize that real food is doable! Using unrefined salt was one of my first baby steps in healing, too! Thanks Lauren! This series has been a long time coming. I love that you started with salt too! Love this. In my youth I would always pass on the salt and butter because I thought both were so bad. Now I’m a salting maniac. I like to use Real Salt brand (especially because they are a local company)… it’s another great choice for people looking for real salt with all the goodness that comes with it. Robin, I’m glad you have come back to salt and butter! I still go overboard on the salt some days, but I am starting to level back out now. I have noticed that Miss Katie does not have voracious salt cravings anymore, and I’m so excited to see another layer of health achieved! I think ours is attached to adrenal fatigue, so this is a big step. It’s very cool that you have such a great local company as Real Salt. Local is a big thing for us too. I myself prefer sea salt from France. Specifically, Sel de Guerande. Much better tasting than the Baleine Sel you can buy locally at Meijer. Whenever someone I know travels, i always ask ’em to bring me some Sel!!!!! 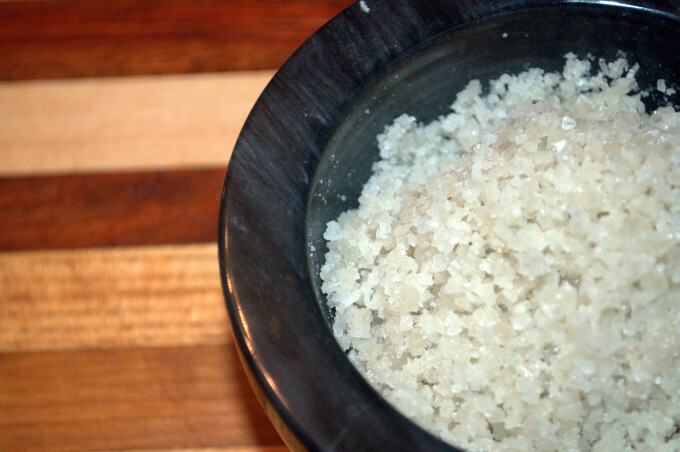 Great article…just ordered the Celtic sea salt in the fine grind because I’m spoiled and lazy! My taste buds will give you some feedback when it arrives. I love that you’re already ahead of the game! Hopefully, you’ll enjoy the salt for it’s mineral-rich properties. The difference in taste is significant if you have well-developed taste buds, especially if you use it on raw veggies or sprinkle it on top of a dish. Yum. I use my mortar and pestle, but you can also use a food processor and possibly a blender if you already have them hanging out in your kitchen. I just bought some sea salt. The only ingredient listed is: sea salt. It is a grocery story brand. How do I know if it is good or not? Suggestions? If it’s pure white that’s often an indication that the minerals have been removed through processing. The only way to truly tell is to contact the manufacturer and ask how they process the salt. I use celtic and real salt. I started about a year ago. I do want to know if I can use it in Canning vegetables. I know Canning manuals specify Canning salt…but can you substitute? I Know that I can home can vegetables with out salt and add it when they are served. Absolutely! There are quite a few websites dedicated to canning with only real food ingredients including unrefined salt. They’d be a god source for measurements.